Thank-you for taking a look at our history. Like father like son, I followed in my father’s footsteps first apprenticing under his direction and then taking over the family business in 1990. R&B Plumbing and Heating is a second generation, local company providing residential and commercial plumbing and heating services. We’ve been serving your plumbing & heating needs since 1972. We service, supply, install and maintain everything we sell. Look to us for hot water, radiant heat, forced air heating and cooling and natural gas services and products. If its emergency service you need, call us 24 hours a day! As TECA members we are fully trained and certified to perform forced air heating and ventilation installations in accordance with Quality First’s guidelines. As a Carrier dealer, we have access to some of the most efficient, quiet, and reliable forced air heating and cooling products available. We are professionally trained to install and service natural gas appliances, and are a member of the FortisBC Trade Ally Network. Are you thinking renovation? Currently partnered with quality builders, we have established relationships with excellent contractors who do just that. Ask us for a referral. Fully bonded and insured, R&B employs only journeyman plumbers and indentured apprentices who take great pride in the quality of their workmanship—quality that our customers appreciate. Are you looking for something better? 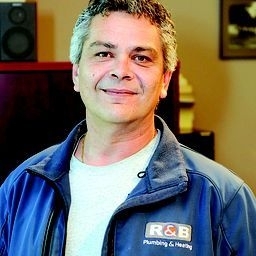 Perhaps it’s time to take a closer look at R&B Plumbing and Heating.